We currently use arrays designed for whole transcript expression and 3’ expression analysis arrays for eukaryotic and prokaryotic samples. We are exploring expanding our services to include SNP and Genotyping analyses. Please visit the IDEAS CENTER if you have input on the types of arrays you would like us to provide. The MIT BioMicro Center hosts a high-throughput Agilent Microarray Scanner, which has the ability to measure fluorescence from two dyes simultaneously facilitating differential gene expression studies. We have just reintroduced Agilent array hybridization services as of October 2009. The BioMicro Center does not currently support the Nimblegen platform. We are currently discussing upgrading our Agilent Scanner to enable it to scan Nimblegen arrays as well. Anyone interested in using Nimblegen arrays should contact Stephen Bell. All submissions must be accompanied by a Affymetrix Submission Form. 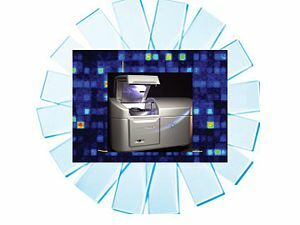 Affymetrix is retiring their old 3' Array kits in September. The new kits are faster, require less starting material, and slightly less expensive (prices will be adjusted soon). Please indicate which type of kit you would like to use when submitting your sample. .dat: The image of the scanned probe array. .cel: Cell Intensity File derived from .dat file. .chp: Output file generated from the analysis of a probe array. .txt: Text File is the same information as the .chp file in text format. Additional data analysis help is available on a case by case basis. Please contact Stuart Levine if you need additional help with your analysis. You will be notified by email that your data is ready. At that time please pick up any leftover samples and arrays belonging to you. Samples will be held at the facility at -80C for 60 days after your data is generated. Please contact Stephen Goldman if you have difficulty obtaining your data. Affymetrix processing prices do not include the cost of the array. In order to be sure we have arrays on hand, we encourage users to contact us several days in advance of submitting samples. >> Price of 3' Expression arrays will be decreasing in early 2009 to reflect changes in the hybridization protocol. After you have completed your scan, please make sure to sign the scanner record form, which is near the equipment and to remove your files from the computer. CD-Rs are available if needed. This page was last edited on 4 November 2009, at 11:26.